I am extremely saddened at the death of this beautiful child. As a parent I can only envision in my worst nightmare what these parents must have gone through with this situation. I am also a pet owner, a pet sitter, and a pet rescuer so I did look further into the issue to see if any details were missed, or any information was not relayed that could be helpful for all of us. What I discovered is that this unfortunate situation included not just one un-neutered male dog but TWO and not just two male dogs but also a female dog in the home. Having an un-neutered dog with children is simply not a good idea. Having two un-neutered dogs in a house with children is a dangerous recipe. Is it easy to blame the dog and blame the breed but as a dog owner and dog advocate and as a parent I believe it is necessary to understand the potential issues with anything we expose our children to whether it be motorcycles, the internet, sports, or even TV. It is important to gain as much information as possible in order to keep our children safe and healthy. 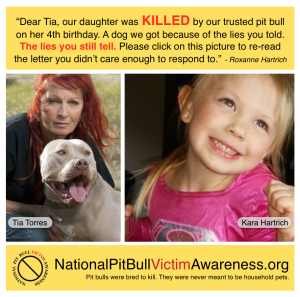 It is true that ‘pit bulls’ are powerful dogs and they are not for everyone or every home. They have a bite force that is generally not matched by other dogs and they have a tenacity to hold on to anything they grip which is a trait of most dogs in the terrier group. Homes with small children would be very wise to do their homework on any dog breed they are considering and to make sure they understand the dangers of any dog or for that matter any cat, horse, turtle, mouse, etc that they expose their child to. But I don’t join the chorus to have the breed eliminated. I don’t join the chorus to vilify Tia Torres as being irresponsible in promoting or rescuing this breed. She does not adopt out un-neutered dogs and she does not promote this dog for all homes. It is easy to become so heartbroken that the only way to find any healing is to single out a cause to fight for or even against. But generally there is usually a series of events or causes or even a layering of problems that actually leads to a single tragedy and although the letter to Tia did not point out some of those additional problems they need to be addressed. Parents should not have un-neutered male dogs around their children whether it is a pitbull or a shih tzu. Parents should not give dogs free access to all parts of a home when small children are present. Parents need to realize that dogs are first and foremost dogs and not people. They do not interpret or reason or view the world in the same way we do. When in doubt they will rely and be driven by their instinct and hormones (ok, that part is like people). An un-neutered male dog is very much like a teenager and as all parents know teenagers can do things that often defy reason and makes no sense but we brush it off as adolescence. Male dogs are in a constant state of adolescence when they are un-neutered. This is a very sad situation and my heart goes out to the parents. I just would prefer to see some good come from the story instead of placing all the blame where it may not realistically deserve to be placed. Is the dog at fault, the breed at fault, the parents at fault, Tia Torres at fault? The list could go on and on but the result is the same a child is gone and with all the pointing of fingers the opportunity to really learn from the situation is lost. My God, will you stoop to aiding and abetting dog fighters with your pseudo advocacy? All your advocacy has done is just help fill the shelters with hundreds of 1000s of castoff pit bulls as the breeders you help breed more and more, and dog fighting grows.